It’s February 14th again, and you know what that means? That’s right! All over the world people are consumed with love … and ideologically-driven murderous bigotry masquerading as love. Happy Valentine’s Day! As expensive cards, dead plants, and boxes of cocoa-rich saturated fat are exchanged by starry-eyed lovers across the globe (ostensibly in the hope that it will lead to an exchange of bodily fluids), we’d like you to spare just a few moments to think about all of those people who, through no fault of their own, frequently experience a different kind of “love”. We’re referring, of course, to the poor souls who suffer the lifelong misfortune of having been born a woman … or a different race … or with the wrong underpant contents, or, heaven forfend, an attraction to those who share the same underpant contents! How lucky all these people are that there are plenty of loving folk willing to murder or maim such abominable, deviant qualities out of them, eh? So, as you and your partner put on matching bunny sweaters and repeatedly use the word “wuv” without any detectable irony, scroll down the page and download yourself an MP3 with which to accompany your stomach-churning declarations of white, heterosexual romance (and, for god’s sake, please don’t breed). After that you’ll naturally want to go and subscribe to our YouTube channel as well! 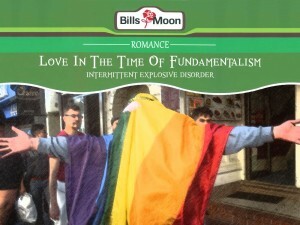 "Love In The Time Of Fundamentalism"